A member of the R/Sea Hawks Cape Coral Flying Club pilots a homemade replica airplane at Seahawk Park as another club member looks on. Photo courtesy R/Sea Hawks Cape Coral Flying Club. During the club's annual "Gathering of the Giants," dozens of replica aircraft are on view at the park. Photo courtesy of R/Sea Hawks Cape Coral Flying Club. 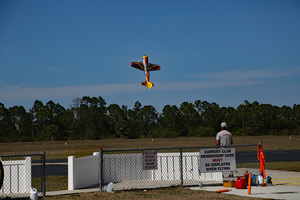 At Seahawk Park, a club member pilots a replica stunt plane. Photo courtesy of R/Sea Hawks Cape Coral Flying Club. A member works on his aircraft. Photo courtesy of R/Sea Hawks Cape Coral Flying Club. 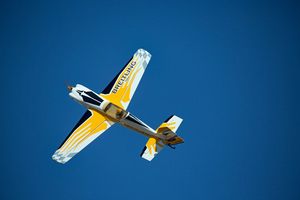 A replica Breitling stunt plane soars over Seahawk Park. Photo courtesy of R/Sea Hawks Cape Coral Flying Club. Some of us never seem to grow up. Building a model airplane as a youngster isn't enough. Having to put away childish toys just doesn't feel right. Some of us refuse to grow up. But those would all be considered positive traits if you are one of them. One of them just happens to be a special breed of adult radio aircraft enthusiasts who love to build and fly radio aircraft. They're dedicated members of flying clubs that number more than 2,500 around the U.S. They religiously follow the rules and regulations governing their chosen hobby. They fly their homemade aircraft at speeds of up to 200 mph and even drop candy to adoring young spectators from high above their paved 600-foot runways! 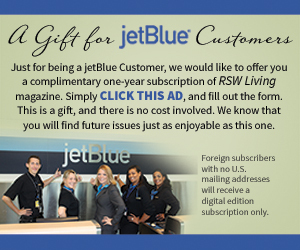 They offer their fans the opportunity to get up close with the model airplanes and to pose questions to the pilots. They give back to their community. And they take great pride in teaching interested students and senior citizens about the history of flight and the art and science of aerodynamics. The rules and regulations that govern this unique flying community are strictly adhered to. Each member of the local R/Sea Hawks Club belongs to the Academy of Model Aeronautics, or AMA, whose primary purpose is to represent its members in all aspects of this unique pastime. The AMA provides liaison services between its chartered clubs and the Federal Aviation Administration, the Federal Communications Commission and other government agencies. It also works with local governments, zoning boards and parks departments to promote local chartered clubs. AMA’s mission mirrors that of its local charter clubs—the promotion, development, education, advancement and safeguarding of all modeling activities. It provides leadership, organization, competition, communication, protection, recognition, education and scientific/technical development to the modelers. It also offers official contest sanction, insurance and assistance in helping local clubs keep their flying sites properly regulated. The R/Sea Hawks have an additional set of bylaws set forth by its constitution that all local members must abide by before acceptance into the club. The primary purpose locally is to actively promote the construction and flying of the aircraft, help new members expand their knowledge of aerodynamics, and to vigorously enforce high standards of safety for both their members and for spectators. So seriously, in fact, that the R/Sea Hawks have an elected board of officers who meet monthly. Each November, club members are nominated for a lengthy list of key positions: president, vice president, treasurer, secretary, helicopter field marshal, jet field marshal, fixed wing field marshal, electric/glider field marshal, safety officer fuel, safety officer electronics and safety officer field. Only members in good standing can be nominated for the leadership positions that ultimately are responsible for fulfilling the club's safety and educational missions. Since 2003, city officials have discussed a potential entertainment destination to be known as Festival Park. City planners envision the 212-acre park as an important venue that could accommodate large populations of residents and visitors—something Cape Coral greatly needs. And although there's currently no timetable for the future park development, the city's real estate division has been busy buying up individual lots in order to assemble the property for the future. Seahawk Park’s 13.5 acres are located within these future park boundaries, at 1030 NW 28th St., between Kismet Parkway and Wilmington Parkway. The city has a written agreement with the R/Sea Hawks that allows the club to operate at its current location. 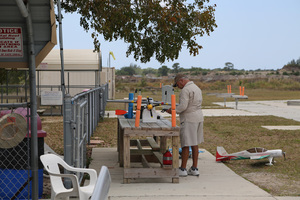 The club manages the airfield and all of the activities that take place there. Between 60 and 80 pilots from throughout the country descend each March on the Cape for the R/Sea Hawks Club’s “Gathering of the Giants” event, which is sanctioned by the AMA. And even though the replicas are dwarfed in size by their actual counterparts, the illusion that’s created in person and on the ground tricks your mind into believing that the models—with wingspans starting at 80 inches—look just like the “Giants” they represent. David Richards, a long-time resident who annually takes his family to the “Gathering of the Giants,” describes the sensation they experience: “You have to see these planes in person to feel and see their full potential,” he states. Mac Hodge from Georgia can't get enough of it either. He's been involved with model planes in one way or another for more than 60 years. He currently travels around the U.S. showcasing his replica World War II B-29 Bomber that boasts a 20-foot wingspan. A few years ago in Cape Coral, he became somewhat of an internet sensation when the largest plane ever to fly at Seahawk Park crashed just minutes after takeoff. Thankfully no one was hurt, but the vintage bomber—valued at $75,000—was a total loss. The ‘Gathering of the Giants’ represents the club's main annual fundraiser. Other events are held at Seahawk Park but none garners the attention, expectations and excitement as the main event. 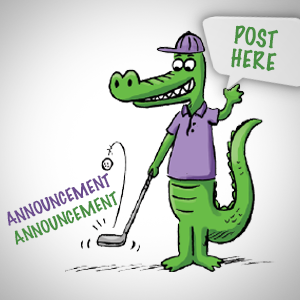 There is no attendance charge; donations of $5 per car help offset the club's yearly maintenance fees. All of its events throughout the year help enable the R/ Sea Hawks to donate to the Mayor's Scholarship Fund, and to support the Cape Coral War Museum and the Cape Coral Caring Center. Club members also spend time teaching about the theories of flight at local schools and senior centers. At the “Gathering of the Giants,” spectators can enjoy specialty foods from vendors. They can meet and talk with participating pilots—alongside their amazing flying creations. And one lucky person who takes part in the raffle drawing will be the winner of a replica aircraft. Paula Kings, a six-year club member, says the event atmosphere is “great people, awesome planes and the best model airfield in Florida!” With almost 5,000 spectators predicted to attend over the course of the two-day event, it features some of the most popular World War-era warbirds, stunt planes, single-wing planes, bi-planes, helicopters and modern-day jets. Most of the models are gasoline-powered or turbine-powered, and some are electrically powered. All of them have their fan favorites. 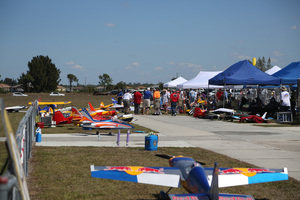 And all of them have experienced operators showcasing their advanced flying skills—as their homemade replica aircraft soar through the sunny skies of Cape Coral. When: March 17-18 from 9 a.m. - 4 p.m. Written by Joe Yapello, a contributing writer for TOTI Media.